Where were you when you first heard The Righteous Brothers sing “You’ve Lost That Lovin’ Feeling” or “Will You Love Me Tomorrow” by The Shirelles? Maybe you were dancing to “Locomotion” by Little Eva or “Up on the Roof” by The Drifters, all songs written by Brooklyn-born Carole King (Sarah Bockel) and her husband Gerry Goffin (Dylan S. Wallach). Working for music producer Don Kirshner (James Clow), known as “The Man with the Golden Ear”, their partnership produced hit after hit keeping them on the pop charts throughout the 60’s. 1650 Broadway. 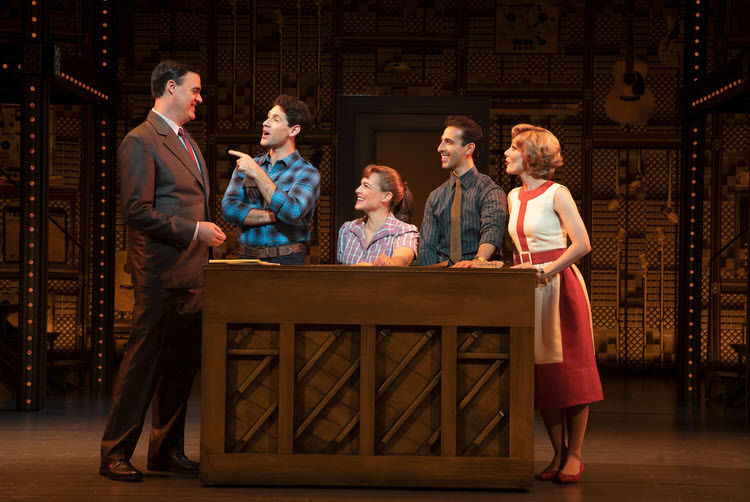 (l to r) James Clow (Don Kirshner), Dylan S. Wallach (Gerry Goffin), Sarah Bockel (Carole King), Jacob Heimer (Barry Mann) and Alison Whitehurst (Cynthia Weil). Photo credit: Joan Marcus. During their early career lyricist Gerry and the precociously talented composer Carole churned out hits at Aldon Music, a music publishing house and hit factory in New York’s Brill Building, where they worked side-by-side with fellow hit makers, Cynthia Weil (Alison Whitehurst) and Barry Mann (Jacob Heimer) in friendly competition. Beautiful tells the story of their romance, marriage and tumultuous breakup. The simple story chronicles their struggles and successes and ultimately King’s solo career, which broke the pop mold with the release of her first album – the four-time Grammy Award-winning, “Tapestry”. 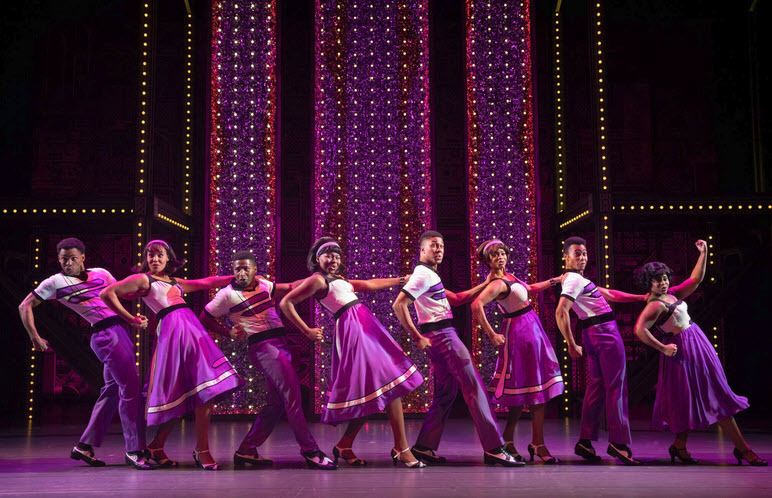 “The Locomotion.” The Touring Cast of Beautiful – The Carole King Musical. Photo credit: Joan Marcus. The latest national tour has rearranged the order of the music. It now opens with Carole on piano at Carnegie Hall. She is singing “So Far Away”, accompanying herself and showing confidence with her trademark masses of wavy hair gowned in a blue-flowered maxi-dress. It was not always so for the shy, yet ambitious teen who wrote songs for the top African American artists of that era. The plot then takes us back to the beginning of Carole’s career, when as a whip-smart sixteen-year old, Carole bucked her Jewish mother Genie (Suzanne Grodner with plenty of comic relief), to peddle her tunes in the Big Apple where she has an auspicious meeting with Kirshner. The Drifters. 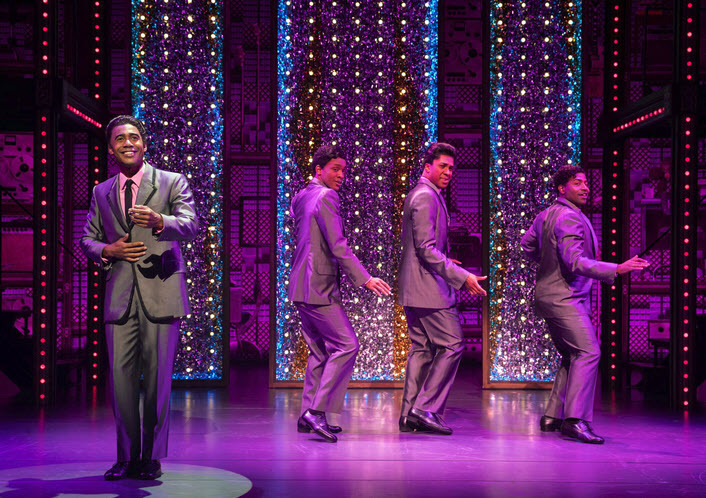 (l to r) Dimitri Joseph Moïse, Deon Releford-Lee, Nathan Andrew Riley and Michael Stiggers, Jr. Photo credit: Joan Marcus. A medley of hits from the 50’s includes some of the greatest hits from that era – “Poison Ivy”, “Love Potion #9”, “Yakety Yak” and “Will You Still Love Me Tomorrow” to name a few. Dressed in flashy sharkskin suits and skinny ties, The Drifters and The Shirelles in their trademark beaded dresses perform the couple’s greatest hits, along with Little Eva (Alexis Tidwell), discovered when she was their babysitter and the entirely fictitious Janelle Woods (McKynleigh Alden Abraham), a glamorous pop singer who becomes Gerry’s extramarital lover. Queens College. 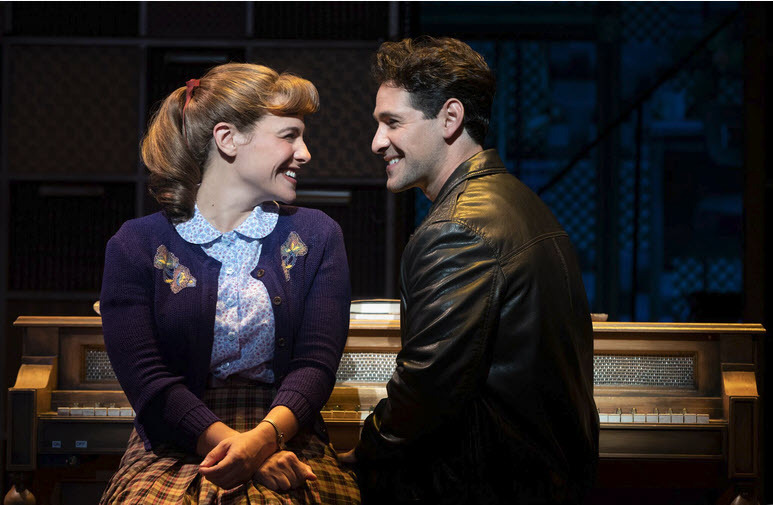 Sarah Bockel (Carole King) and Dylan S. Wallach (Gerry Goffin) ~ Photo credit: Joan Marcus. The musical is light on script, but heavy on songs, twenty-seven numbers backed by a twelve-piece orchestra. But that’s just fine as you’ll probably be silently singing along, tapping your toes and recalling your first dance, first kiss or first breakup. Goosebumps kick in with “Some Kind of Wonderful”, Gerry and Carole’s first duet, and The Righteous Brothers big number, “You’ve Lost That Lovin’ Feeling”. Scenic Designer Derek McLane captures the mood by creating a wall of instruments and tricking out the musical performances with hundreds of moving, neon-colored lights. Mid-century modern furnishings reflect Carole’s home and office. 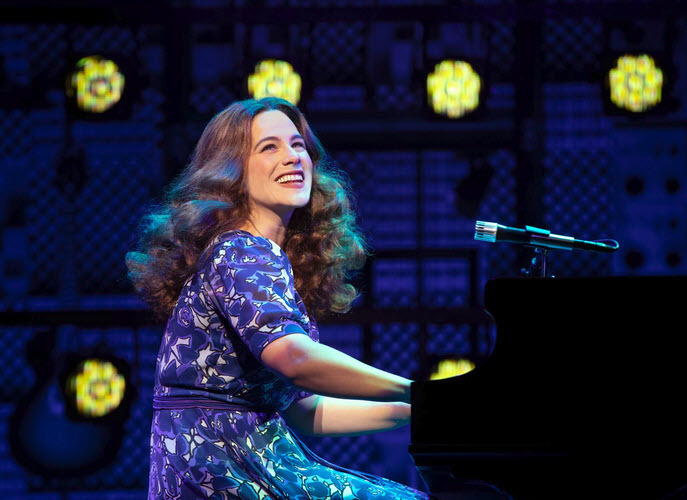 “Natural Woman.” Sarah Bockel (Carole King) ~ Photo credit: Joan Marcus. 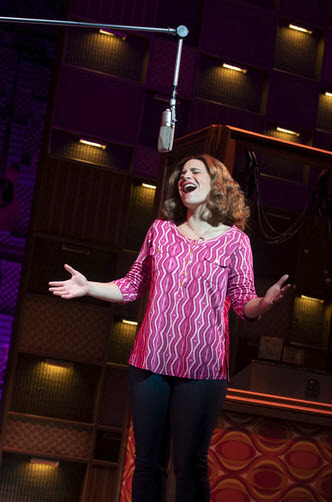 Bockel does a superb job as Carole, especially at the end of Act Two when she lets loose her powerful voice on the biggest hits from the album “Tapestry” – “Natural Woman”, later covered by Aretha Franklin and Mary J. Blige, and “Beautiful”. The musical reflects Carole’s coming of age as an independent composer and soloist who has emerged from pain and loss to find joy and recognition as an artist in her own right. See it if you love the music of this era, or even for the music with its sweet harmonies and catchy lyrics that draws us back to an age of innocence. Book by Douglas McGrath; Words and Music by Gerry Goffin, Carole King, Barry Mann and Cynthia Weil; Scenic Design by Derek McLane; Costume Design by Alejo Vietti; Lighting Design by Peter Kaczorowski; Sound Design by Brian Ronan; Wig and Hair Design by Charles G. LaPointe. Through December 30th at the National Theatre, Washington DC – 1321 Pennsylvania Avenue, NW, Washington, DC 20004. For tickets and information visit www.TheNationalDC.org or call 202 628-6161.